Sooner or later in life, that thing which we thought would never happen – could never happen – happens. We think, “how can life go on after that?” And yet, life does go on. We emerge on the other side, and find ourselves still intact. Life everywhere is life. Our head gets chopped off, so to speak, but our heart remains. We are turned inside out, but survive. No matter what you are going through, your life is not over until you are dead. No matter how bad it is, there is still hope – before God – for redemption, for change, for light, for breakthrough. Put your hope in God while you wait in the darkness. 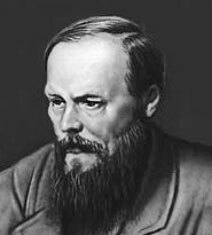 Dostoevsky wrote his best books after he got out.